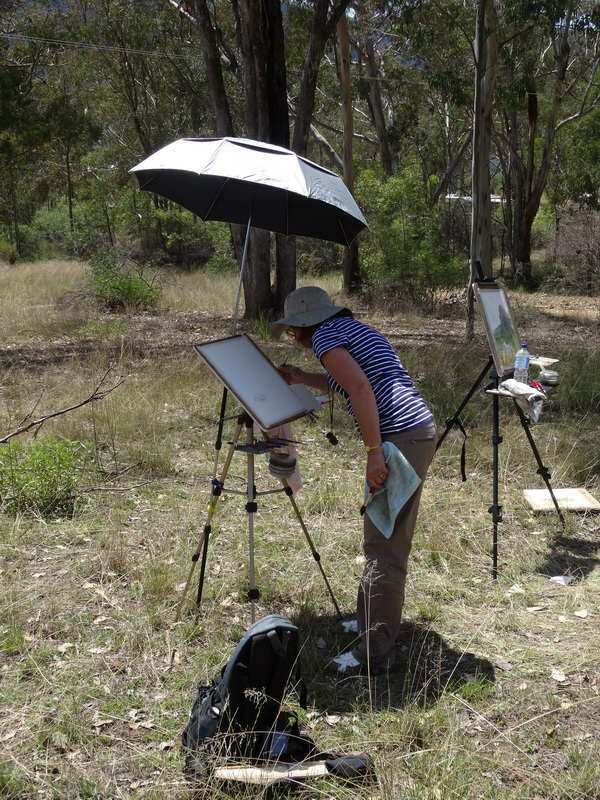 Sometimes plein air watercolor painting problems seem tougher than at others due to non-ideal conditions, if you are on holidays and are there to paint then you just have to try and make the best of your environment. 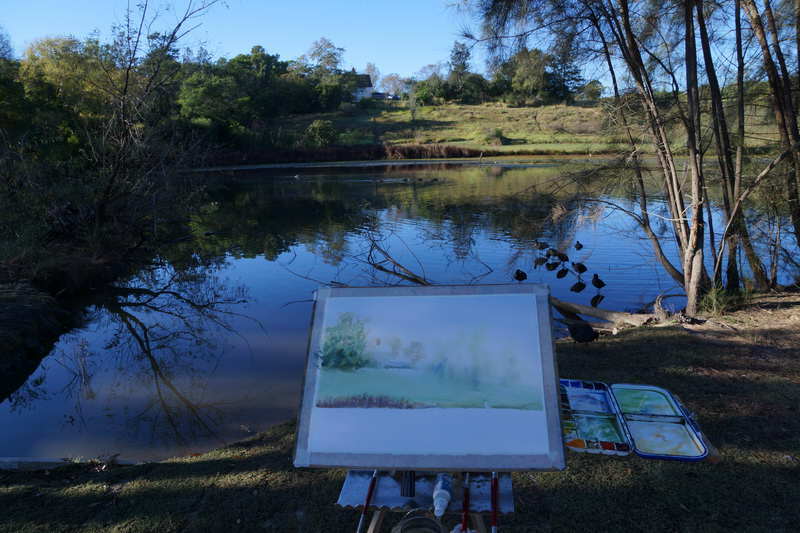 I recently spent 4 days painting at a little New South Wales town called Glen Davis. The daytime temperatures got up to around 99 degrees (37 degrees Celsius), the wind was also quite strong. These conditions, in addition to annoying visits from flies and biting insects made plein air painting with my watercolors quite a challenge. 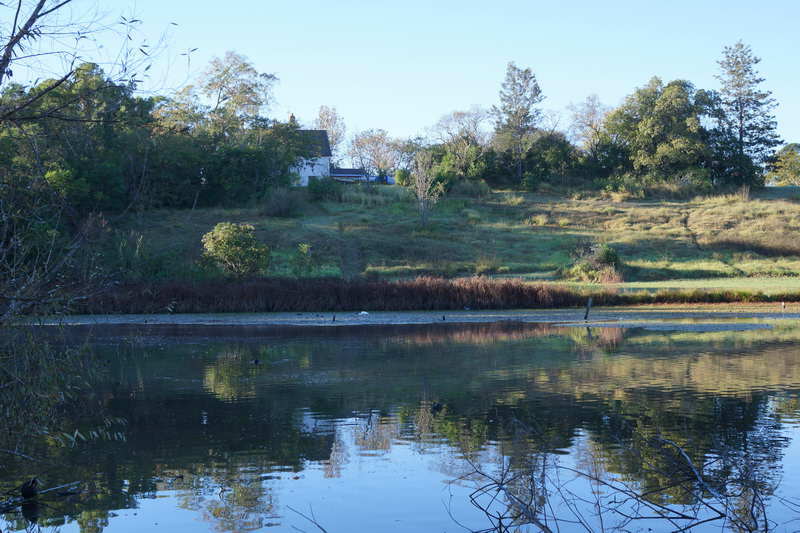 Glen Davis is situated in the Capertee Valley, from which the Capertee River flows. 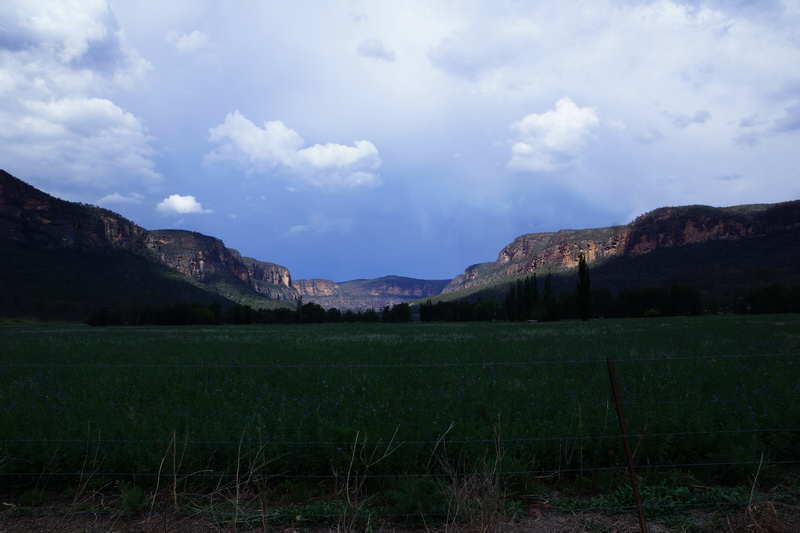 The valley forms a canyon that is the widest in the world (larger than the Grand Canyon). Glen Davis is located north of Lithgow, New South Wales, off the road to Mudgee. The town and its surrounds are an artist’s paradise with magnificent views all around. 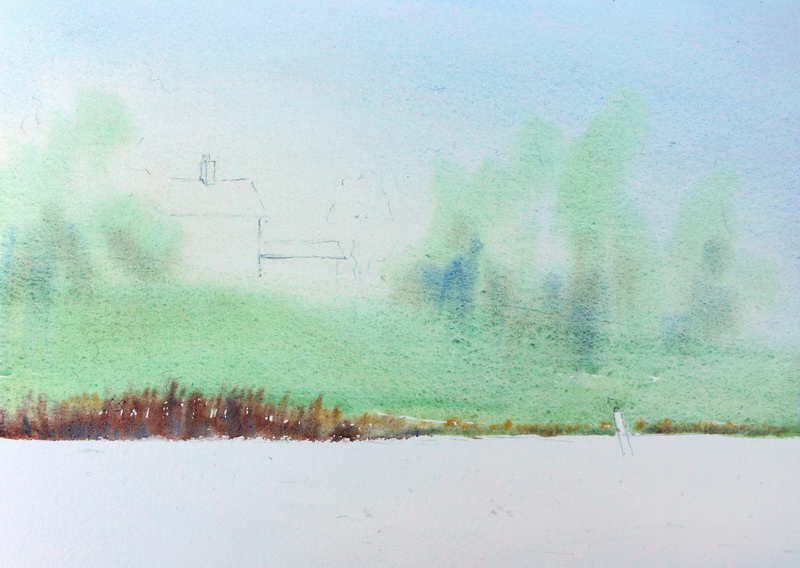 My strategy was to try and get some painting done very early each day, while the temperature was still quite pleasant, even fresh for a little while, before it got too hot. So I would grab a quick cup of coffee and head off to do a painting before breakfast. 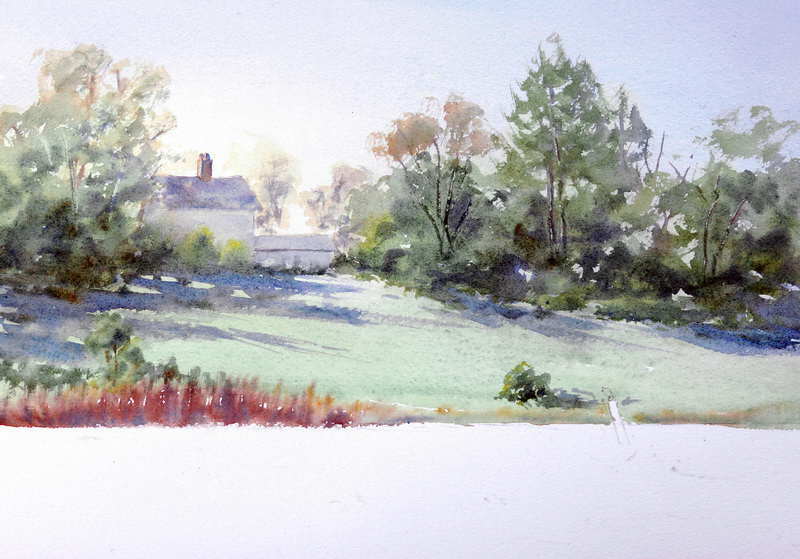 With the cooler weather my main concerns were the slow drying time of my paper and the rapidly changing light. I did one half sheet watercolor painting and 9 quarter sheet over the four days. 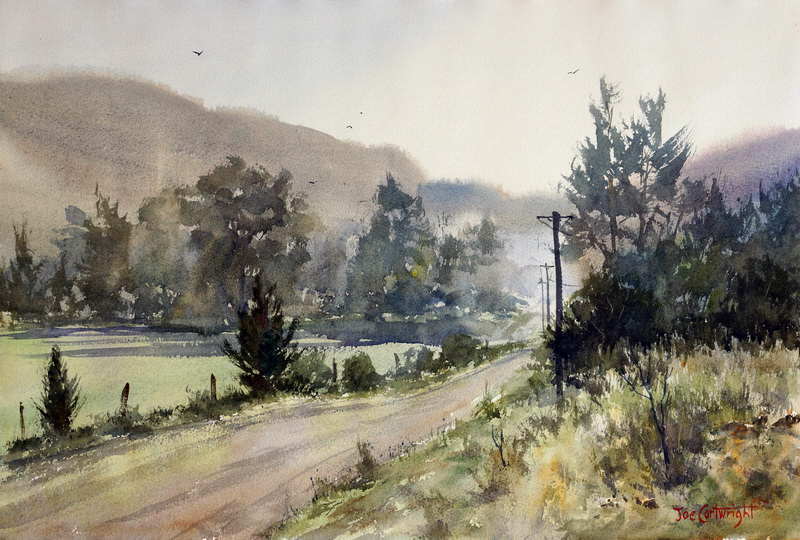 A common mistake plein air watercolor artists make is to try and continue working on top of a damp under painting. It is critical to make sure your under painting is totally dry before you start working on your second wash. To speed up the drying I placed my painting in my car and used its air-conditioning system to help dry it. Other problems to overcome early in the day was the rapidly changing light, and atmospheric effects. 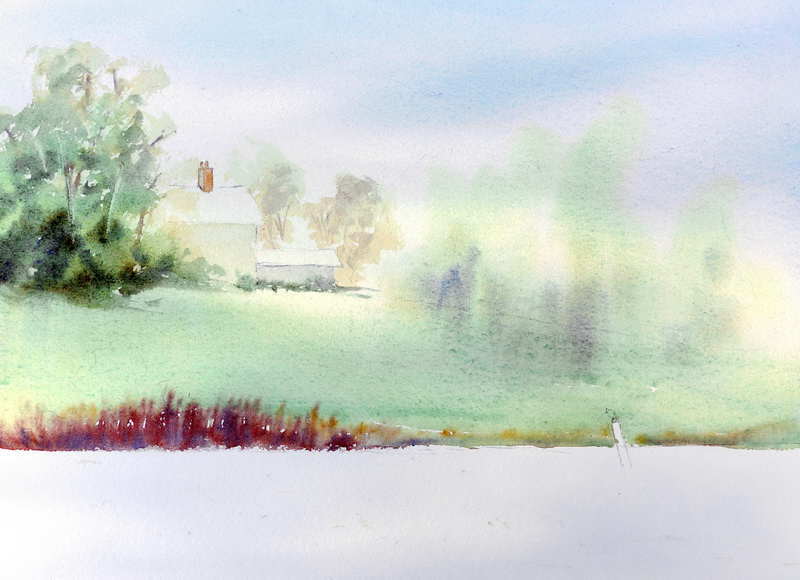 One painting I did which managed to capture the last of the early morning mist required me to keep in mind just what the mist looked like when I first started to paint as it was long gone by the time I had finished my painting. 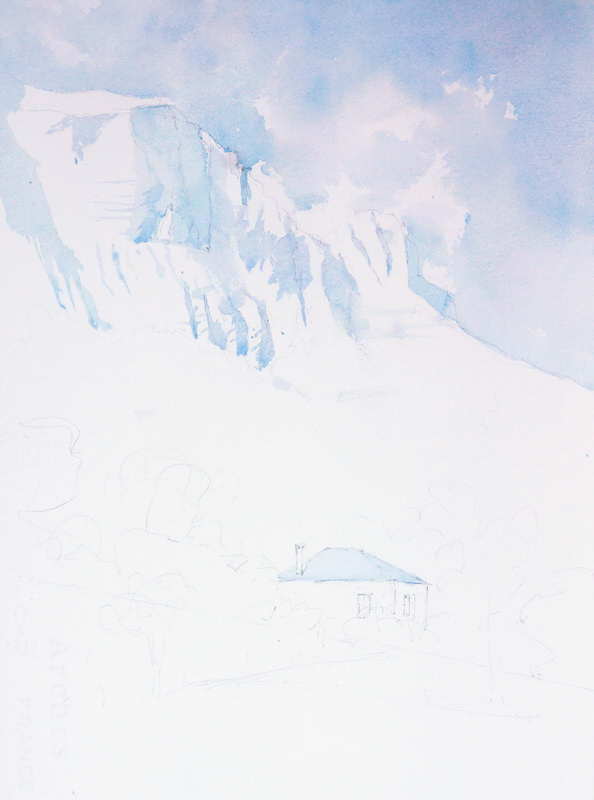 In another painting, with strong light and shadow shapes on the cliff faces I painted the shadow shapes at the same time I painted the sky, with a light version of the sky color. This allowed me to see just where the stronger shadows should go when I was ready to paint them. These shadows too had moved on by the time I was finishing the cliff face but having them recorded with the light sky color meant I had no problem. Sometimes too, if I had my easel face on to the subject I was painting, it meant that the sun would be directly on my watercolor painting surface. This makes your work dry even faster, plus makes it harder to judge tones – to say nothing of it being hard on your eyes. This is where an umbrella is very useful but if you don’t have a suitable one then turn your easel around so that your board shades your work. You would then look at the subject and then look back down at your work and paint the next section. Getting one painting done before breakfast usually meant I had at least one good painting for the day which made the rest of my efforts a lot more pleasurable. Later in the day the problem was the reverse with my work drying too fast! Painting in the heat of the day requires a different technique. As the heat and wind rose, I either stayed back at our camp or made some adjustments to my equipment and procedure to allow me to continue to paint. I have a light umbrella which I use to shade my painting surface in those situations where there is no natural shade. Also I would give my watercolor paper a light spray before starting my under painting. This spray of water was just to get the temperature of the paper down to give me a little more time before my wash would dry. I also kept spraying my painted surface lightly with water to keep the shine on the paper as needed. However despite this you will still find your watercolor washes will still dry very quickly. This is part of the plein air challenge. I use large brushes, e.g. a 24 round, for the initial under painting, after I have mixed much more paint than I needed. If you don’t mix enough you will run out part way through a passage and risk muddying up your watercolor wash as you try to mix more paint while your painting is rapidly drying. Once the underpainting stage is done you can work in smaller areas with smaller brushes making the effect of the heat less important. Remember to still mix more paint than you need however. 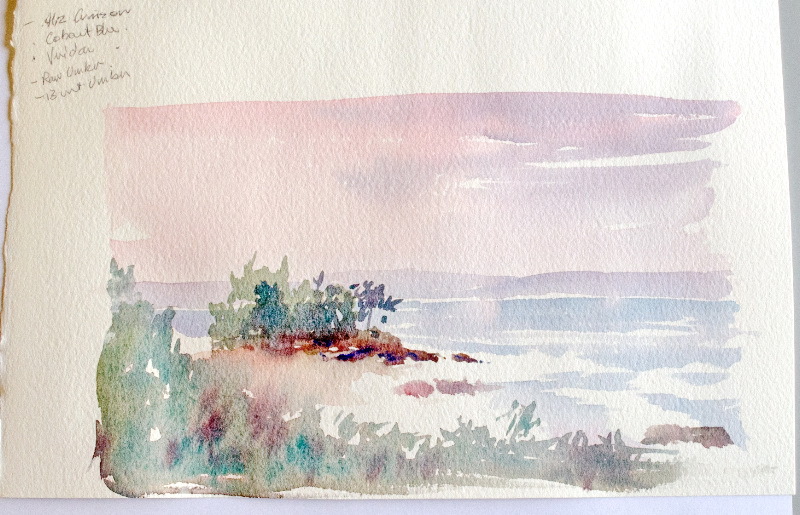 It is surprising just how fast your watercolor paint will dry in hot and windy conditions. If you don’t want to mix lots of paint then just paint smaller and leave the bigger paintings till your skill and speed of painting improves. Despite the heat one morning it was rain that was the problem. In this case there is nothing you can do but take you painting and hop into your car. Never try to continue with a watercolor painting in the rain. It doesn’t work! 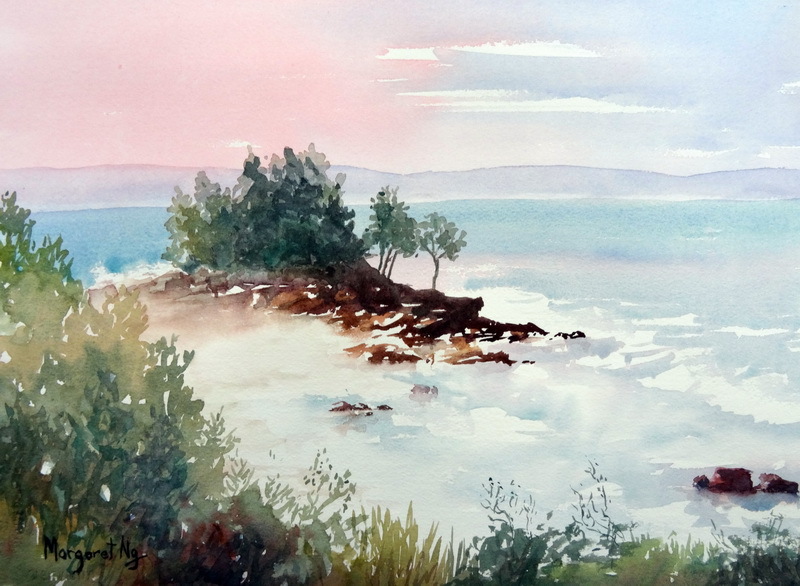 Recently one of my students painted a nice watercolor seascape. 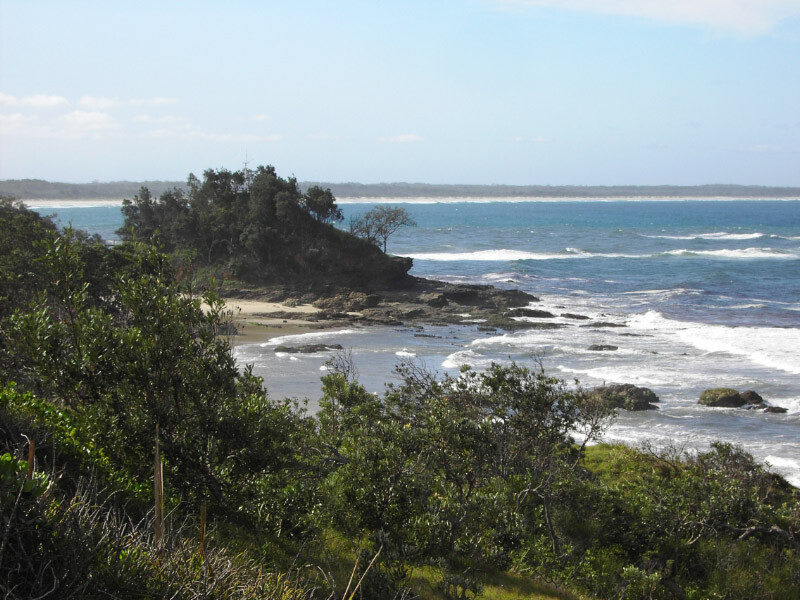 Her reference photo was of a coastal scene at Port Macquarie, NSW, Australia. It was of a bright day and her original painting reflected this. However she wanted to change the mood of her painting and was not sure how to go about it. So I suggested that she creates a series of watercolor thumbnails to find the color combination that would provide the mood she was after. Obviously there is a lot more to changing mood than just changing color, such as varying edges, adjusting areal perspective, even textural effects. However this is a simple way to make “a change” in the mood of your painting. For example,changing a sky color from blue to red or vice versa immediately alters the mood and feeling of your painting. I will write more about painting mood and how to change it, with other techniques, in future articles. 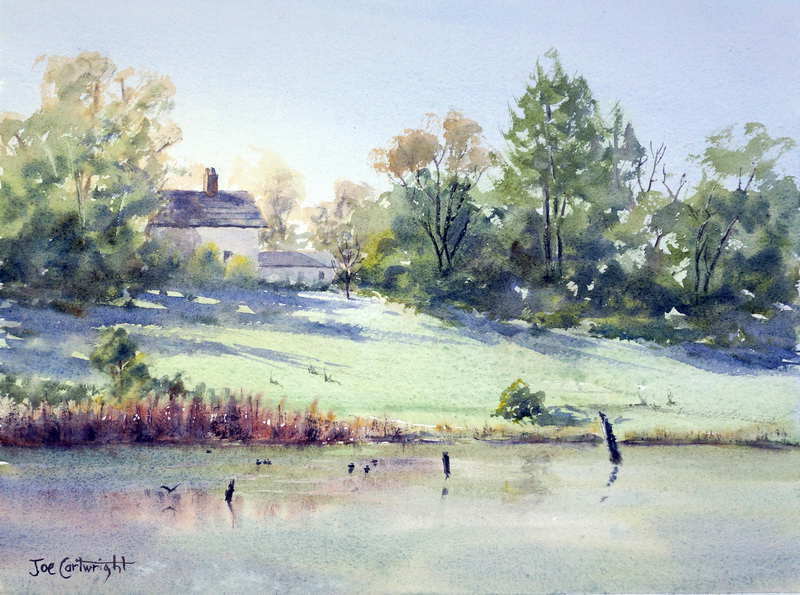 After producing this painting, Margaret now wanted to paint the same scene but with a different mood. Because she tended to put in too much detail when doing this type of exercise in the past I had her paint her 2” x 3” swatches with a large brush (size 16 round). This stopped her from getting too detailed and let her free up and play with various color combinations. Students usually find this exercise quite fun as they can play with the colors rather than getting bogged down in detail. Below is a photo of the various color combinations she produced. As you can see the swatches are all quite small so she was able to fit quite a few on a quarter sheet of watercolor paper ( 14.5” x 10.5”). 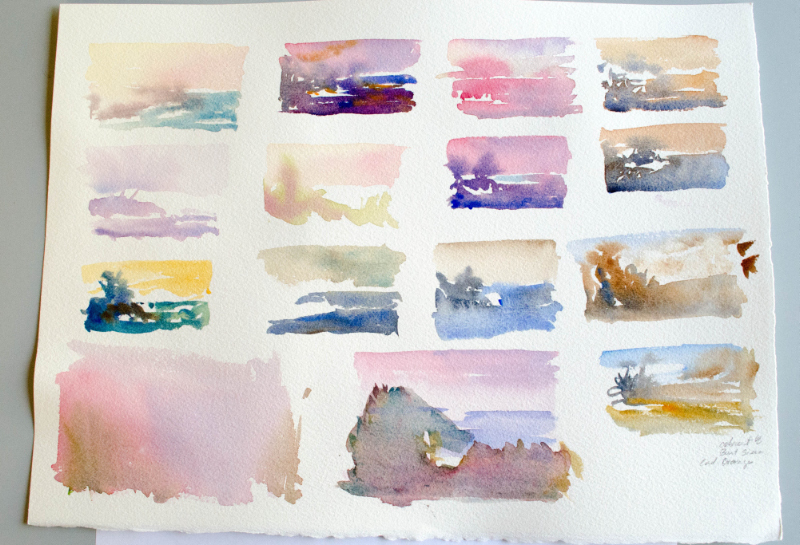 Watercolor swatches about 2″ x 3″ Painting mood can be easily changed with colors. After picking the color combination that best represented the mood Margaret was after (second from the right, top row) she did a larger sketch of the scene using these selected colors. The image below is the result. This time she included more details. The bulk of the painting was done with a size 16 round brush with a good point. 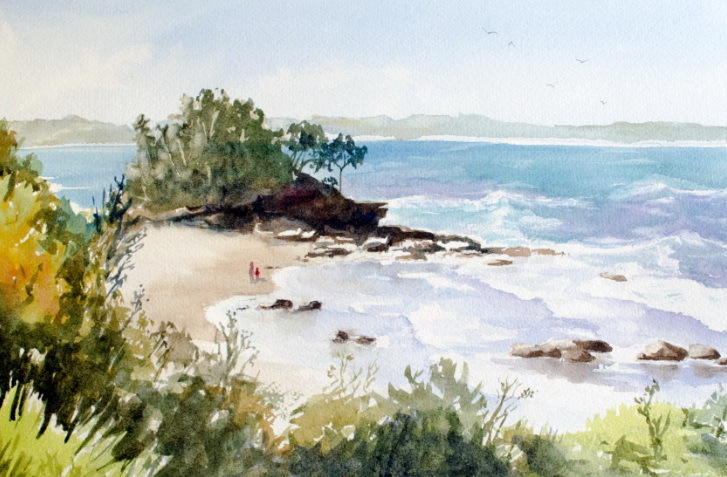 However for some of the details she used a size 8 round watercolor brush. She was now able to confidently move on to her final painting. The result is the watercolor painting below which was a very good result. You can apply this technique yourself anytime you are unsure of how to proceed with the colors for your painting. When doing this exercise, it is important not to allow yourself to tighten up by using too small a brush. You are not trying to create tiny works of art but just looking for color combinations you can use in a larger finished artwork. So next time you are stuck with what colors to use for a particular mood you are trying to achieve with your painting why not give this a go.